Rafa Benitez says there’s NO chance of Christian Atsu leaving Newcastle United in this transfer window. Turkish club Basaksehir have been linked with a move for Atsu, who is on a season-long loan at St James’s Park. Newcastle have an option to buy the winger at the end of the campaign. And United manager Rafa Benitez insists the club are in “control” of the situation. Benitez also believes that Atsu, away with Ghana for the Africa Cup of Nations, is “happy” on Tyneside. Benitez has been in contact with Atsu, Senegal’s Mohamed Diame and DR Congo’s Chancel Mbemba since the trio left for AFCON at the start of the month. 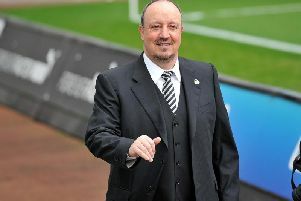 “I am in contact with the three players in Africa, and especially Atsu,” added Benitez. “I will tell you now that he is really pleased and really happy here. Atsu – who has not made a competitive first-team appearance for Chelsea – has scored three goals so far this season. And the 25-year-old is ready to “settle” at a club, having spent the past three years out on loan. Asked about his future last month, Atsu said: “For me, I always want to settle. Benitez is likely to wait until the end of the season before making a decision on Atsu’s future. Rafa Benitez is hopeful that Aleksandar Mitrovic will make a quick recovery from the injury he suffered in the FA Cup. The Newcastle United striker suffered a deep gash on his leg in last weekend’s 1-1 draw against Birmingham City. Mitrovic was given oxygen as he was stretchered off the pitch at St Andrew’s. However, United manager Benitez is confident that the striker will be back on the field next month. “I spoke with him and he is progressing,” said Benitez.